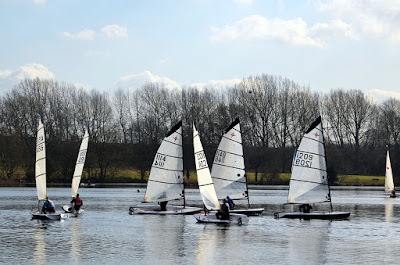 If you are seeking advice on sailing, contact us on info@wgcsc.org.uk and we can discuss what we can do to help you. 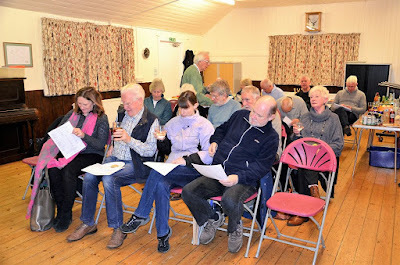 NEW MEMBERS are very welcome, so come and join us. So we’re off again. 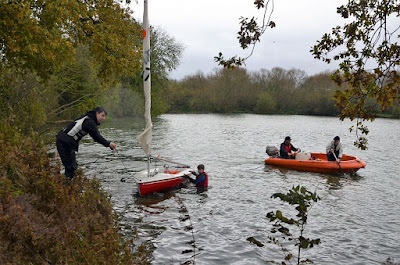 The first two Saturdays of the year were surprisingly amenable, if somewhat chilly for those on rescue duty. 5th January was Winter Pursuit 9/10 with Paul McAlister in charge as OOD. It was bitterly cold, but the wind was good and steady, and just about perfect for both of the races. Everyone enjoyed the racing very much. The first race was won by Patrick Rohart (Supernova), and the second by Annette Walter (Comet). 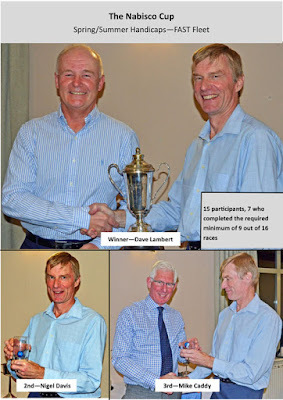 12th January was Winter Handicap 11/12 and Paul Lohr was OOD. The weather was grey and moody. 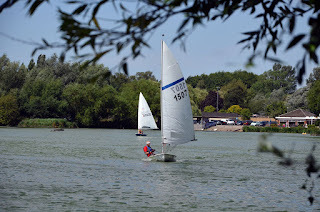 The wind forecast was for 14mph and gusting, but the reality was an almost flat calm lake with breezes here and there, getting a little brisker in the second race. This meant tactics were key. Making the right choice about exactly where and when to tack meant significant gains could be made, whereas making the wrong choice … yes well ….. The first race was won by Patrick Rohart (Supernova), and ………. drum roll …………. the second race was won by (Miracle) Charles Adams. “Almost certainly because Annette got tangled up with the fishermen!” he gamely admitted afterwards. Which way did he say we were to go...? That's right, Dave. Be carefull, it's cold. Ask Patrick. Someone has to do it. Thanks to Sheila and Roger for sitting out the chilly weather. It was like the Ten Green Bottles! Paul McAlister and his "Christmas Card Moment"
The Welly Christmas Pud winners were the worthy survivors, David and Mike (1st & 2nd FF), and Annette and Phil (1st & 2nd SF). Congratulations to the four of them for giving us some great entertainment on the day. 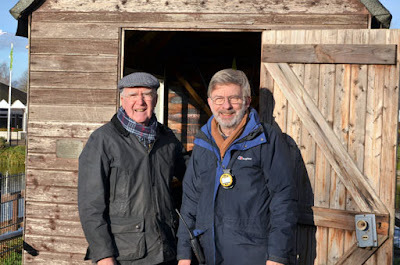 Thanks to OOD Ian Stringer for providing instant results without a calculator or computer, and his Assistant Elf, Dave Campbell. 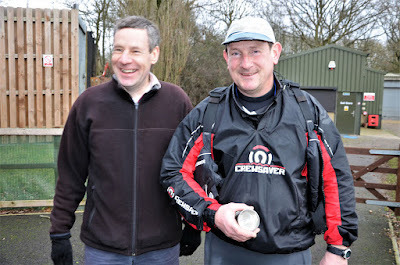 Also, the rescue team of Tim Hogan and Simon Hawker who had a freezing and very busy time. While our heroes were battling it out on the water, most of the Mouse Club were sitting in the beautifully warm conference room occasionally looking out of the window. 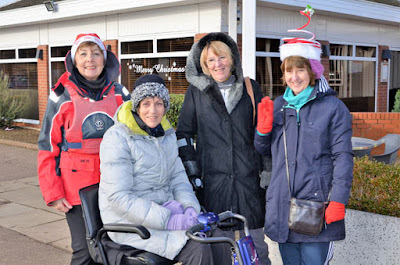 By a happy chance, they also happened to be first in line for the hot punch and mince pies provided by Marjorie Adams, the biscuits donated by the Cardinals, and the Italian Panettone kindly given as a goodwill gesture to the club by the café! 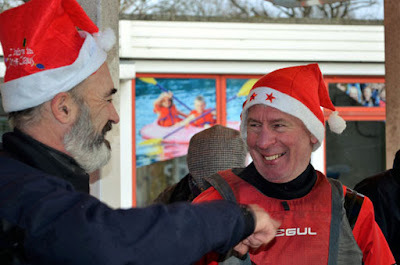 As ever, the Pud Regatta turned out to be a Happy start to Christmas, and it was great to be joined by some former Wellys and club friends, including Frank Puranik, Janet Wilson and Callum, Charles’s daughter Mhairi with her husband Nic and baby daughter Elodie, and Ash Cato and his two grandchildren Imogen and Sienna. 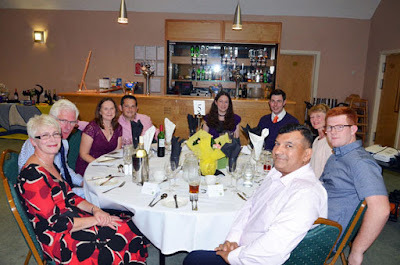 The Annual Dinner was once again held at Mill Green Golf Club, a favourite venue which really seems to suit us. Staff are always very welcoming and the food is good. There were 41 guests on five tables. 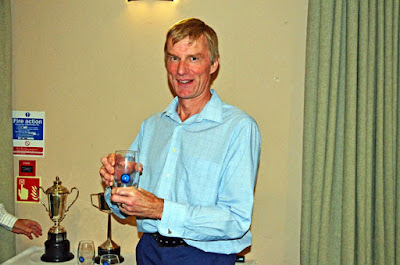 Next, was Simon Hawker, a relatively new member, who’d ‘had his arm twisted’ to propose the Toast to the Club. He quickly had everyone laughing about happenings on the lake and Welly characters. Could this man have a bright future we were all thinking?!!! 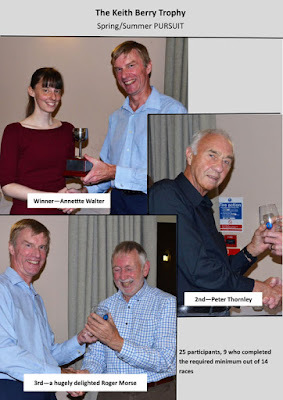 Race Officer Charles Adams concluded the evening by making presentations for the Spring/Summer Handicap and Pursuit events, which he jokingly summed up as: “David Lambert won the Fast Handicap and Annette the rest!” Neither of them was present, but he was able to hand over Welly glasses to Phil Walter and Nigel Davis for their second places. 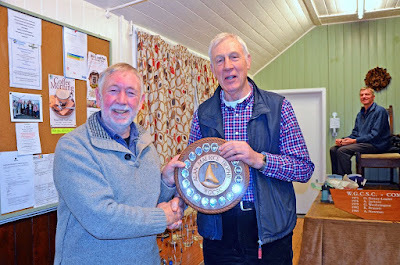 Finally, there were two Commodore’s Cup presentations – the Backbone Trophy to Val Newton (who at 7th was the highest placed helm who had not won silverware in the last 5 years), and 1st Junior Shield to one of our newest sailors, Oscar Hayward. 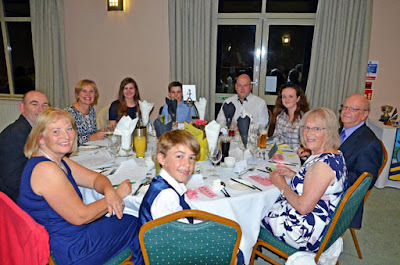 A big ‘thank you’ to Sheila Stowe for liaising with Mill Green on behalf of the committee, and doing the booking, sorting menu choices, invitations, table allocations, place settings, flowers and SO much more. 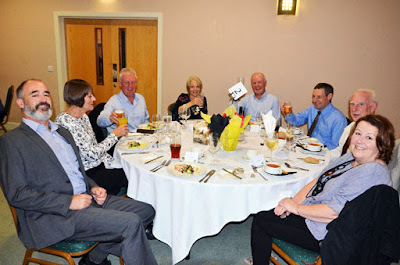 See all Val's pics from the Dinner here. 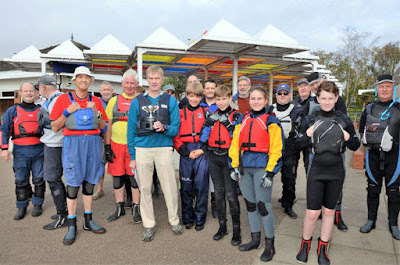 It was to be Commodore Nigel Davis’s last ‘Commodore’s Cup’ before leaving us and relocating to the Midlands. Conditions could not have been more perfect with wall-to-wall blue sky and a light wind. Sailors and Mouse Club turned out in force to support him. A total of 14 boats took to the water, and spirits were high. The event was run as the best two of 3 x 3/4hour Pursuit races – a format which made things very interesting. Annette Walter scored two firsts and was the Winner of the Commodore’s Cup. Mike Caddy took a surprise first place in the second race. Commodore Nigel Davis also excelled with two second places (sadly he didn’t have a storybook ending to his tenure as our Commodore! ), with the other 2nd place being taken by Phil Walter. The final running order at the top was Annette, Nigel, Phil, Mike. 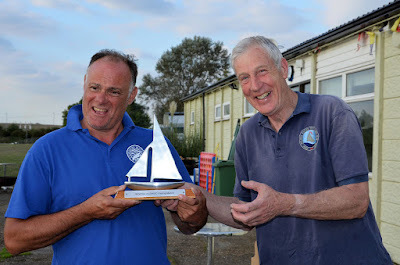 The Backbone Trophy went to Val Newton at 7th, and Oscar Hayward, who was sailing his new Comet bought from Nigel, was 1st Junior and awarded a Shield. 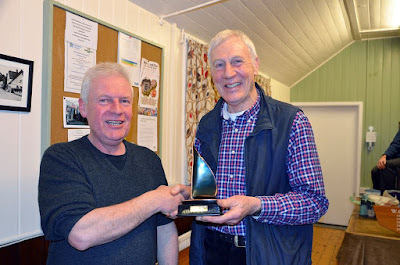 Val and Oscar received their trophies at the Annual Dinner that night. 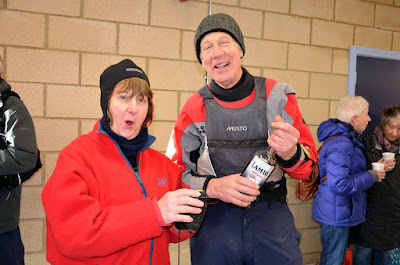 Thanks to the OOD team of Ian Stringer and Sheila Stowe for running three races that morning, and appreciation to the Rescue team of Tim Hogan and Simon Hawker who oversaw the big fleet. trounced by Annette and Michael! 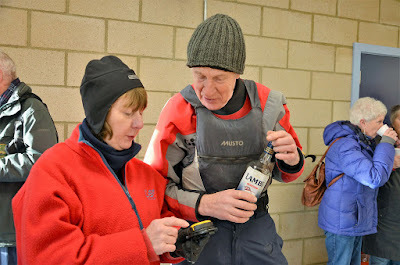 In spite of Dave Lambert and Patrick Rohart being pumped up for action, and having a serious ‘Team Talk’ before the race, they lost the much coveted Punchbowl Trophy to Comet sailors Annette Walter and Michael Ettershank. It was a disappointing result for Supernova sailors Dave and Patrick as they’d hoped to make their winning streak three-in-a-row, but it was not to be. 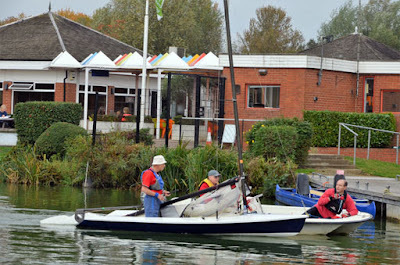 They eventually sailed into third place after Shaun Smale and Dave Campbell - also in a Supernova. Annette and Michael were particularly nippy when it came to changeovers after each lap. They were not afraid to nose-dive into their boat amid a shower of splashes. Shaun and Dave C kept the pressure on them throughout, but their changeover style was more “stately”! Dave L and Patrick had some fun times as they exchanged places but sometimes it didn’t all go according to plan (take a look at Patrick’s face). Also see more photos of the pair in the album (here). 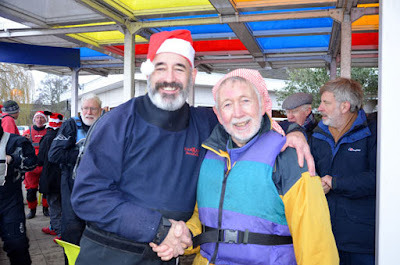 It was a great pleasure to see Tony Hale on the water after a long absence. He partnered Paul McAlister in another Supernova and they came in 4th. 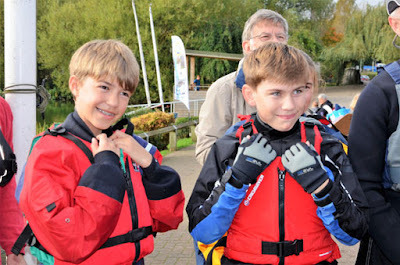 Finally, Junior team Ben Hawker and Oscar Hayward campaigned a Comet and had a lot of fun even though they were last. It was Oscar’s first ever race with the club and he was elated throughout . Even a knock on his head by the boom at the end of the race failed to dampen his enthusiasm. 4th - Tony and Paul were a last minute pairing and had a great time. 5th - Peter complaining to Charles: “I can’t get my leg over”! 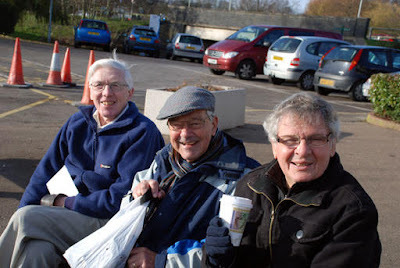 who all enjoyed cake and hot punch after the race. See all Val's photographs here. Just as we’d trained up Nigel Davis to be a good Commodore (!) and taught him to become a decent Supernova sailor, he’s given us the sad news that he has to leave Welwyn Garden City for work reasons. He’s relocating to the Midlands. 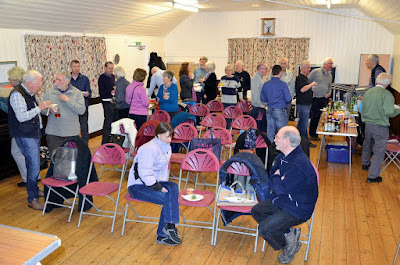 Nigel will remain in post until the next AGM, and will endeavour to visit as often as he is able. He hopes to be at the Commodore’s Cup and Annual Dinner. 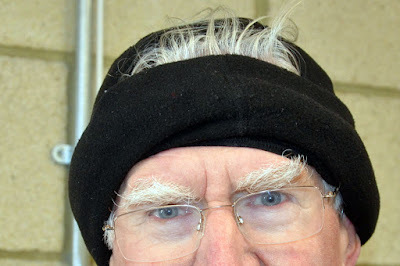 In the meantime, committee members and past commodores will give cover whenever necessary. 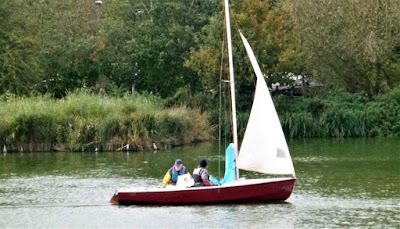 As in previous years, we advertised the “Summer Evening Sailing Sessions” (June to end of August) on the club noticeboard, and Sheila Stowe got together a rota of rescue drivers, rescue assistants, helpers to get sailors afloat, and helpers to look after onshore admin and meet-and-greet. 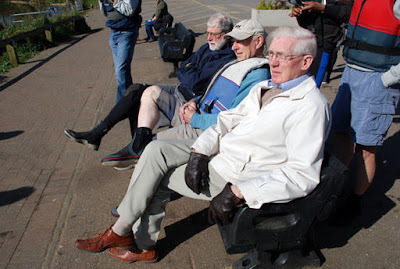 Each Thursday evening “the Summer Evening Team” turned up full of anticipation but, disappointingly, there were few participants. Some evenings there were none and we all went home early! We are still trying to work out why the response was so poor compared to the last two years. 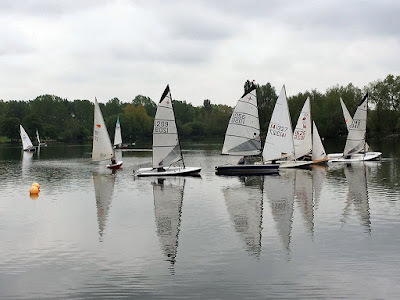 However, it was very rewarding to welcome keen new sailor, Joan Thomas, on at least five occasions, as well as Letitia Matthews and her husband Ian McCreery who turned up one evening for a practice session in their Mirror. (Joan and Ian & Tish have joined the club as a result). 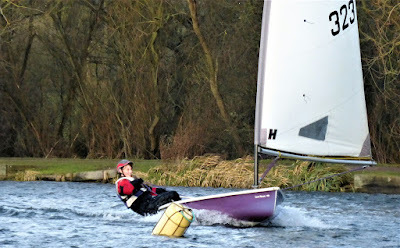 Welly members, Tom and Will Etherton, also came down for an evening sail whenever they were able. Ready and waiting! 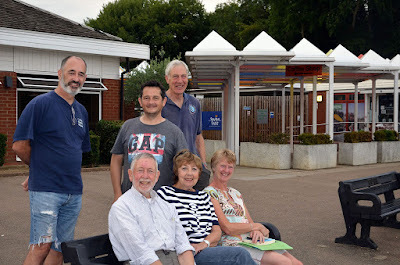 This was the Summer Evening Team on one of the nights – back row l-r – Shaun Smale, Paul McAlister and Charles Adams, front row Roger Morse, Val Newton and Rosemary Turner. Sheila Stowe was a regular, and other helpers included Simon & Louisa Hawker. who won the Inter-Club trophy once again! We all had a fabulous day at Stewartby. 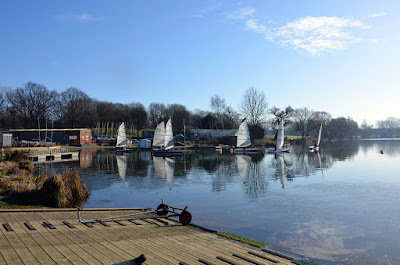 The sun and wind could not have been better, and we could not have been made more welcome by Stewartby Sailing Club. 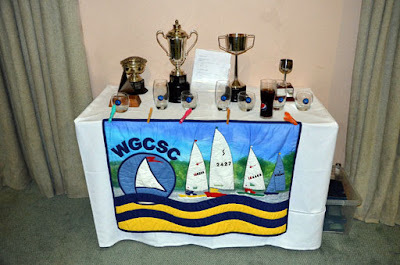 Thanks to SWSC Commodore Gerry Howcroft and all the members for their warm hospitality. Just a pity the complicated calculations didn't swing our way at the end. Ah well, there's always 2019! 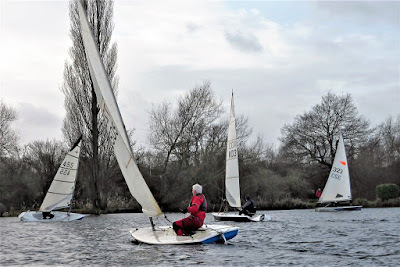 Welly Pete Thornley gives his first-hand account of the racing: “The weather was perfect for our annual inter-club challenge, with decent winds, occasional planing gusts and challenging competition. A windward start on open water was an almost forgotten experience, but I managed a reasonable start in both races. “I was fortunate that my Stewartby contacts enabled me to borrow a newish Streaker. 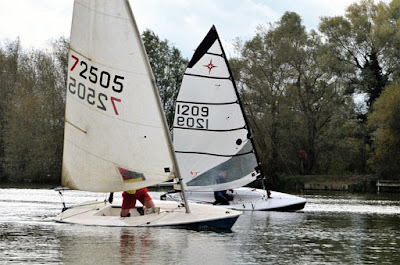 It took me a while in the first race to get to grips with different control lines layout, so I was back in the pack, gaining a bit later in the race, then losing it with a 180 brief windshift! Then somehow the race officer lost my result on the computer, but I was eventually awarded 3rd place - quite unexpected. 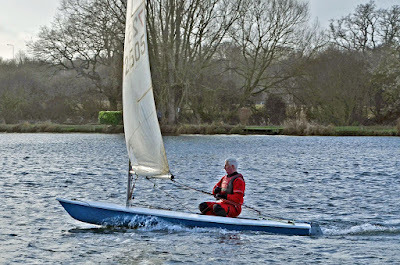 “In the second race my good friends and rivals Bill and John in Streaker and Solo didn't get a good start, so I was clear of them and following the faster boats round the first mark. I hung onto their coat tails for a good time, and pulled clear of the chasing pack, to record a 4th I think. 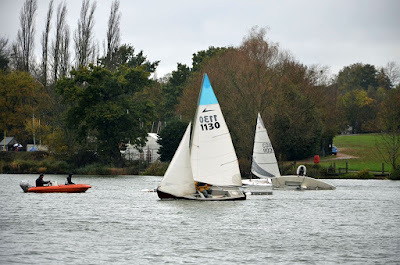 There was an extra fast boat, an RS 300, in this race which won, but its overall result didn't count as it missed the first race. 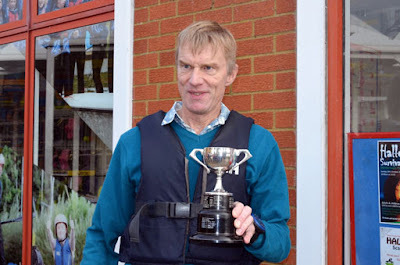 “Overall, I was 2nd, which was surprising, and very welcome.I noted that some of our slower boats, Charles and Phil, also did well in the second race. 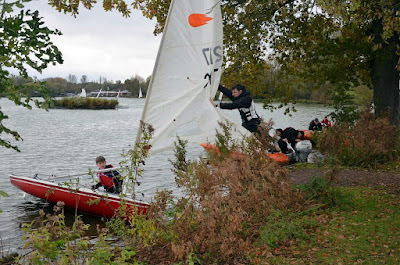 “We lost the competition, after a complicated calculation using averages and fractions, but did not disgrace ourselves, and we all enjoyed the freedom of a big windy lake. Well almost everyone. 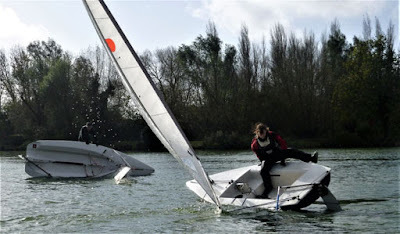 I did hear a Supernova sailor* muttering unpleasant things about sailing a Laser! The Supernova sailor who had difficulty sailing a Laser was Dave Lambert. 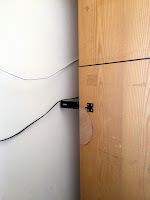 The Laser – which had been borrowed from Stewartby - turned out to have a few problems. As he was rigging it he noticed there was no self-baler bung in the cockpit but decided to use it anyway. Unfortunately, by the time the first race ended, the boat was full of water. 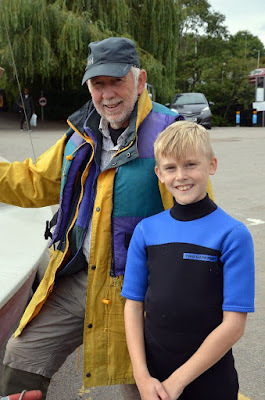 During the break, he and Shaun turned the hull over and found the self-baler was stuck open – it had literally been scooping up water as the boat sailed along. They did a quick repair job by pressing it closed and securing it with heavy duty duct tape. This worked for a couple of laps but then failed and again Dave eventually found himself sitting in a bath of water. 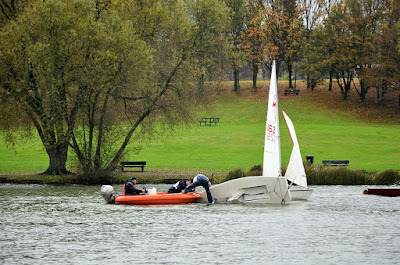 Understandably, not one of his best sails! 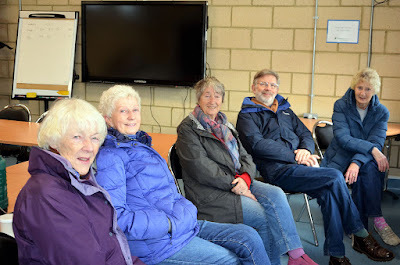 There was a good turn out of Mouse Club members including Marjorie Adams, Thelma and Brian Cardinal, Lin Smale, Lynn Lambert, Maureen Blunt, Pauline Shaw, Sheila Stowe and Val Newton who all enjoyed the sun and beautiful surroundings. Click to see an album of Val’s photos of the day. 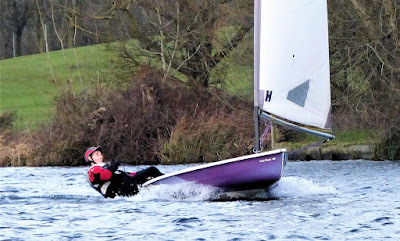 Joan Thomas did a Level 2 course while on holiday earlier in the year and felt the club’s summer evening sailing sessions would be ideal to help her get a bit more practice. Her husband, Rory Scales, is a keen leisure sailor too but unfortunately has a heel injury at present restricting his sailing. We look forward to seeing more of Joan and Rory. 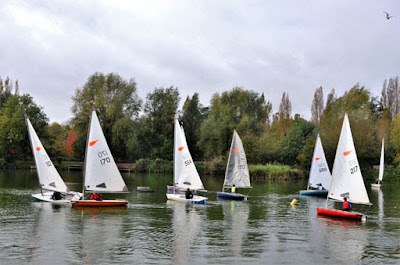 Letitia (Tish) & Ian (and their children Millie 12, Finley 10 and Amelie 5) first appeared on a Saturday morning when Burgee racing was well under way which meant they were unable to have a proper sail. 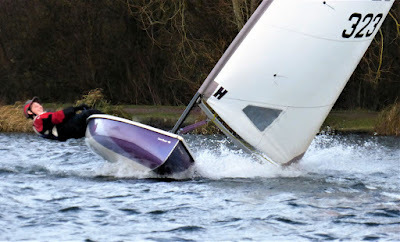 However, it gave them the chance to say ‘hello’ and practice rigging “Upsy Daisy”, their beloved Mirror 861 dinghy. 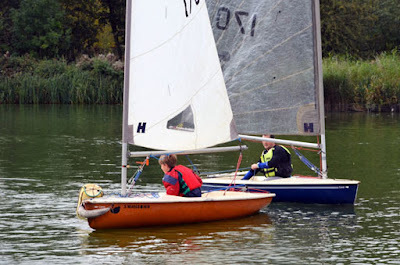 A few weeks later, Tish and Ian arrived at one of our Summer Evening Sailing sessions and were well looked after by Shaun Smale and Paul McAlister who helped them rig and followed round in the safety boat. 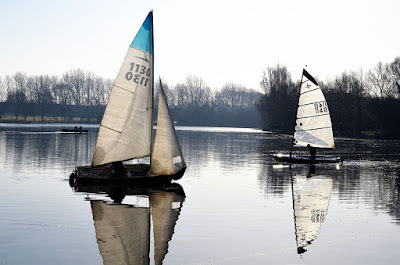 Tish learnt to sail on the Norfolk Broads in a boat belonging to her father. Tish and Ian are also keen on big boat sailing. 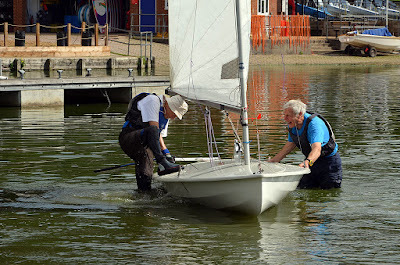 She is currently redoing her Day Skipper and he is doing his Competent Crew qualifications in the hopes of going flotilla sailing at some point. Oscar and his Mum, Julie-Anne Clark, first arrived on the scene on Saturday 8th September. 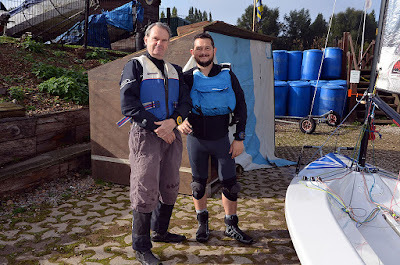 Roger Morse kindly took Oscar 9, out as crew in the Leader (here they are afterwards) and Oscar proved that the junior Level 3 qualification he gained in Greece had prepared him well. On Saturday 15th September he paired up with Ben Hawker 14, for the three-hour Punchbowl Pursuit. 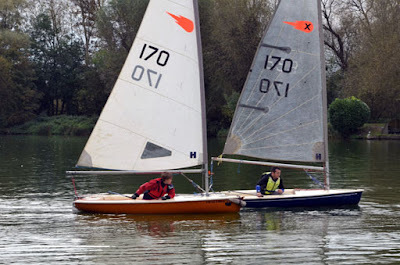 It was the first time he’d raced on his own with the club, and he sailed with confidence. Unfortunately, the wind picked up on his last lap and he had an unfortunate knock on the head from the boom. Rescue brought him ashore so he could be checked over by a first aider and have an ice pack applied. 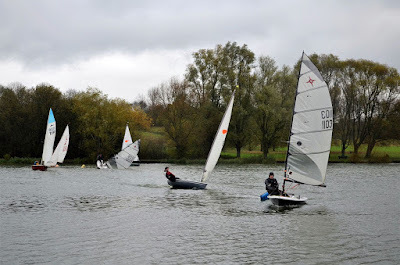 Ben finished off the sailing so the pair of them could still win a giant Toblerone each at the end! Two juniors all grown up! Mike Caddy’s son, Jack, used to be a junior sailor and a familiar sight on Saturday mornings. On 18th August, he reappeared after a long absence, as Rescue Assistant - all grown up and with a good job after graduating. He attended the University of Birmingham and studied English & Philosophy, and is now working in London as an account manager for a telecoms company called Zayo. These two pics, taken 12 years apart, tell the story. The one on the left was taken after the Punch Bowl Race back in 2006, the other at the Spring/Summer Handicap 15/16 race session on the 18th August 2018. Welcome back Jack! 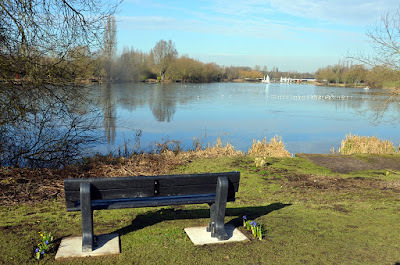 Many of us can still remember the first Saturday Idris Wurie turned up at Stanborough Lake. He was a small lad wearing a blue knitted hat and looked a bit lost. 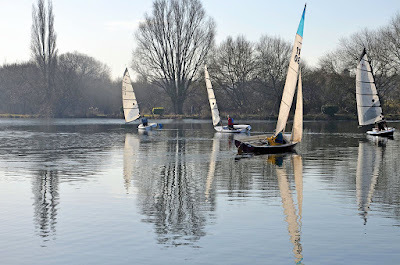 To everyone’s amazement, he took to sailing like the proverbial duck to water. Scroll forward to 2010 and he was thoroughly enjoying himself camping with the club at Little Paxton. 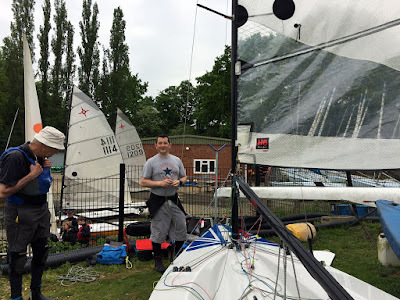 He did so well in the sailing that he won an award (to mark the 40th Anniversary of the 24hour Sailing Race) – a free sail bag from North Sails. He was absolutely thrilled. 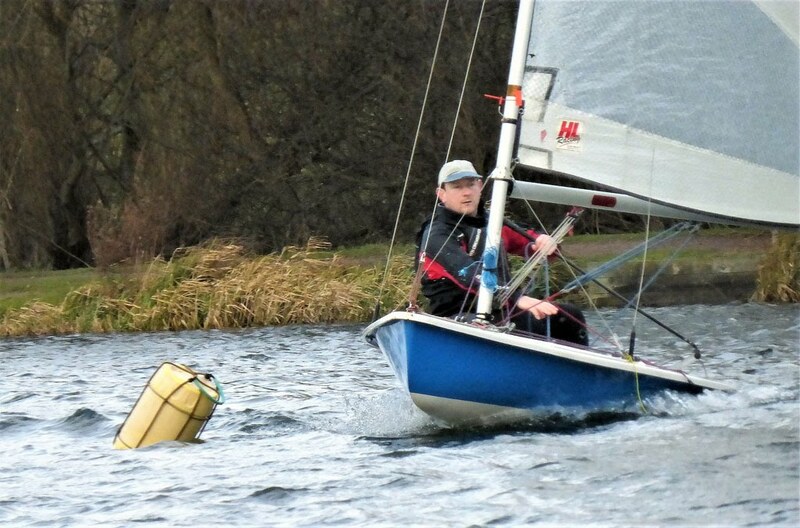 A year or two later, Idris also enjoyed an epic sail with Shaun Smale, crewing his Laser 3000 ‘out on the wire’ at Stewartby. 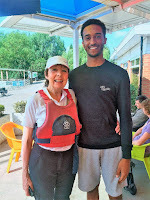 He eventually disappeared off to University in Wales to study Psychology – his ultimate ambition is to be a doctor – and guess what … in August he called in and stood next to Val Newton and towered over her – he’s now 6ft 3in! 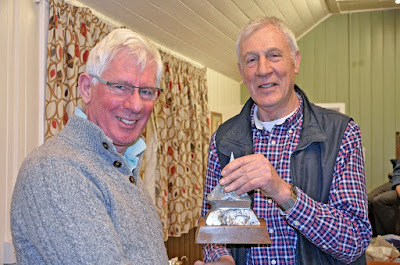 High gusty winds were forecast for these two S/S Hcp series races, but it didn’t deter seven hardy Wellys – Charles Adams, Nigel Davis, Dave Lambert, Peter Thornley, Mike Caddy, Annette Walter and Will Etherton – from going out and doing battle. 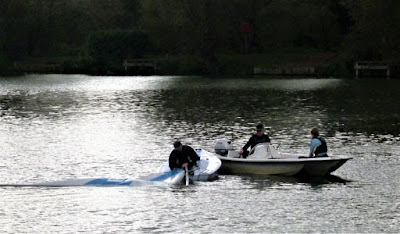 They treated us to a virtuoso display of planing, controlled gybing, and capsize-and-recover manoeuvres. It was all very entertaining. When the results were issued, Race Officer Charles, said “Mike Caddy did very well today but didn’t do 5 laps in race 2”. Annette Walter came 1st in both races. Will Etherton fought a great fight, but came 7th and 7th. Congratulations to all of them for “giving it a go”. 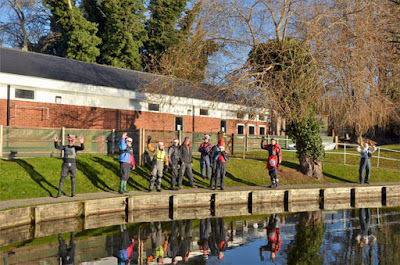 Briefing the hardy Wellies Calm conditions at the start Old Salts! Pete Thornley shows how it's done! 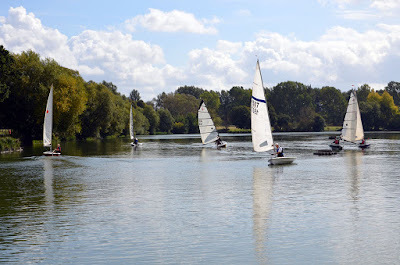 There was no sailing at Stanborough Lake on Saturday 14th July but it was all in a good cause. 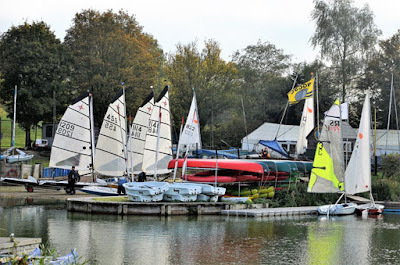 Race Officer, Charles Adams explains: “We racers gave up a week’s sailing (and the Mouse Club a Saturday morning of coffee and cake) to allow the anglers to have a major fishing competition over that weekend. 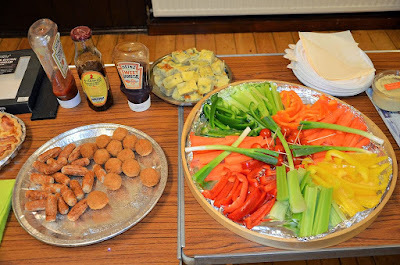 It proved to be very successful and raised nearly £1,500 for charity. 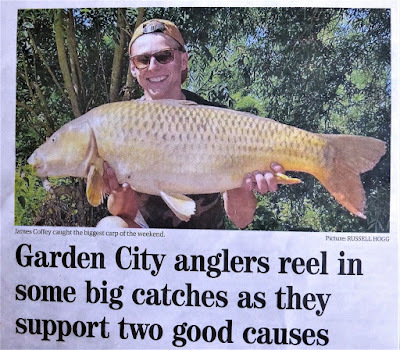 The biggest fish caught was a 24lb common carp landed by James Coffey. 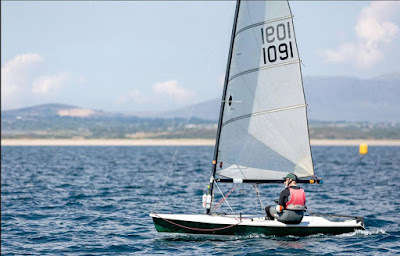 Our two Welly heroes drove all the way to the Plas Heli Welsh National Sailing Academy at Pwllheli, in north-west Wales, to take part in the Supernova Nationals, the weekend of 6, 7 and 8 July. Temperatures were in the high 20s, the wind was light, and well over 100 boats fought it out on the sea. • he came 92nd overall, so not last then! “Booked accommodation for my parents at Pwllhelli, Wales. 3rd floor, shared bathroom on the first. 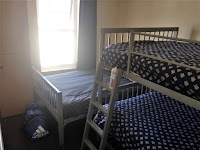 Sleeps 6 - double bunk and double bed fills the room. Not too bad for £44 a night. Heavy Metal Music Bar downstairs serving to 3am on Saturday night. Bin men around at 5.30am. Guys came to paint the building on Sunday morning. The owner is a nuclear physicist who decommissioned the local power station. No need to turn lights on at night - cupboard would glow." "The Supernova Nationals have a Buddy System. 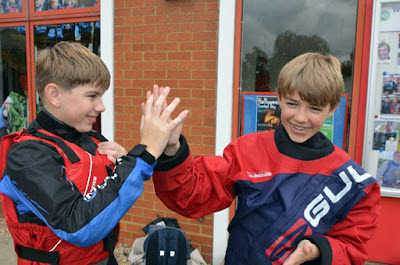 Each gold fleet member is allocated a number of entrants in a buddy system. My gold fleet member was next to me at the boat park. We got talking and he said he had borrowed the boat and had never sailed a Supernova before. 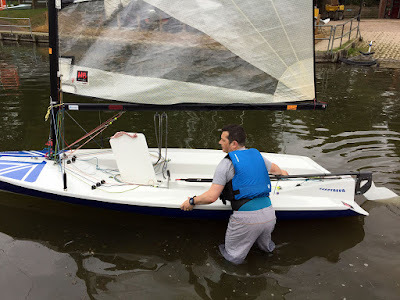 I gave him some tips – throw it through the tack as it likes to stick in irons and it won’t point as high as a Laser unless you get the boat speed up first. He thanked me and off we went. 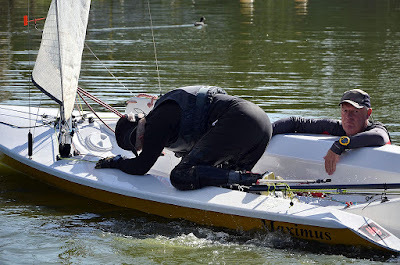 I fought my way to the back on the upwind legs, and slowly slipped forward on the downwind legs, playing the waves. I asked him how he got on, on his first day in a Supernova, ‘Good’, he said. ‘2nd overall’!!!! It turned out he is some sort of LASER CHAMPION. After that I asked him for tips! 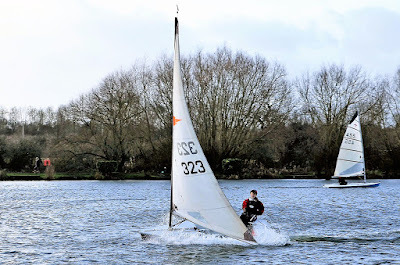 It did not help, my upwind speed was so bad that when the wind dropped I could not make the windward mark because my headway did not match the tide. Eventually the wind filled in by which time I was half a leg behind (we are talking 4-5 lengths of Stanborough). On the downwind I made up 20 places. Cut in on a starboard tack, but then lost it on the reach to the finish line as I could not make the line without a port tack across the fleet and they all fetched it, coming in last! 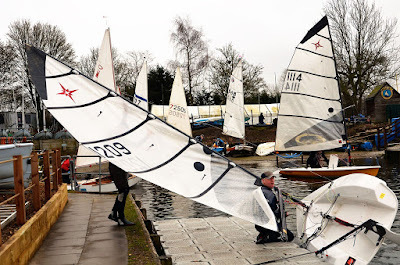 Never been a problem in past nationals as it has always been much too windy and I usually end up near the middle of the fleet. This time I was at the back. Did some research and measured the sail, draft nearly 60%, no wonder it was OK downwind and so bad upwind. Can’t justify a new sail so looking at tapered battens to put some life back in the sail." 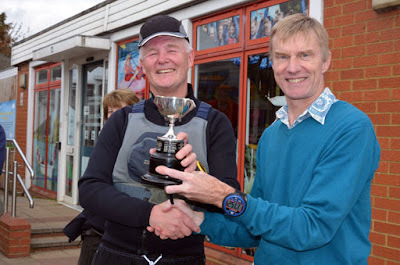 OOD Ian Stringer (left) presents the Summer Regatta Slow Fleet trophy to Phil Walter. 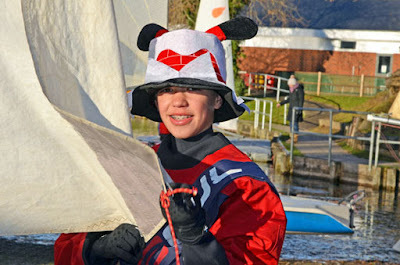 A lovely sunny day, a great turnout of sailors, and the Mouse Club was fully represented onshore. It couldn’t have been better! 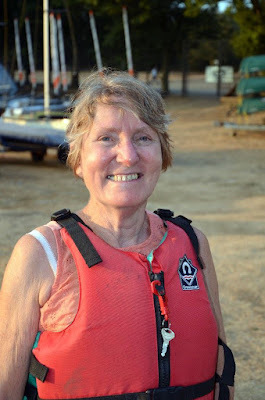 Val Newton chalked up ‘Last Place’ in the Regatta (no trophy for that), thanks to a DNF in the second race. Wiped out by a sudden gust, she went into the water up to her neck and couldn’t right her Laser as the mast was stuck in the mud. Rescue Driver Tim Hogan decided to abandon the boat until racing finished. He and his assistant then tried to haul Val into the Rib but her buoyancy aid was too loosely fitted so he told her to hold on to the side and towed her ashore. An ignominious finale - no photos exist. She hasn’t sailed since! 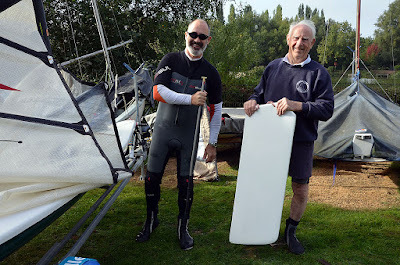 There was much excitement in the dinghy park on the 12th June when Paul McAlister “unwrapped” his 50th birthday present a day early – Supernova 1056. Many gathered to admire its immaculate condition and mid-blue hull, and noted the extra sail, carbon tiller extension and road trailer. There was an approving thumbs up all round, especially from the other Supernova sailors. It had been brought south from Hartley Boats of Derby. 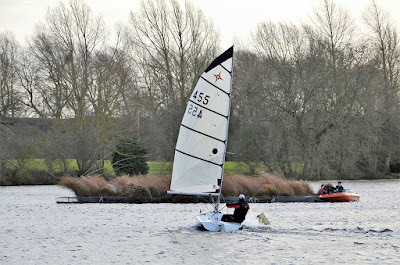 Sailing conditions were light so Paul had a chance to put his new toy through its paces in the two pursuit races. Amazingly, he wasn’t last and was ahead of Charles in both! 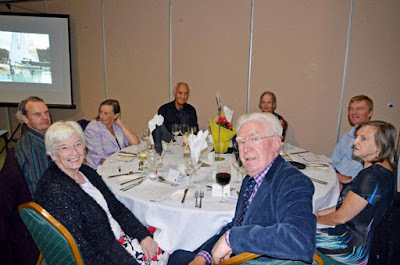 At coffee time, Paul’s wife, Karen, arrived with wine, cheese and biscuits and other delicious nibbles, and a celebration party was enjoyed at The Mouse Club table by sailors, mousers, and former commodore Frank Puranik (who took the pics). Welcome to the Welly Supernova fleet Paul, which now numbers six: Dave Lambert, Patrick Rohart, Alan (Dave) Campbell, Nigel Davis and Shaun Smale. Competition is definitely hotting up! 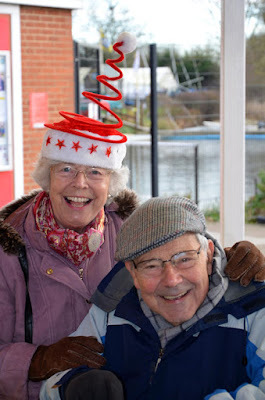 Mike Clarke, ace Merlin Rocket sailor and elder of the club has died. 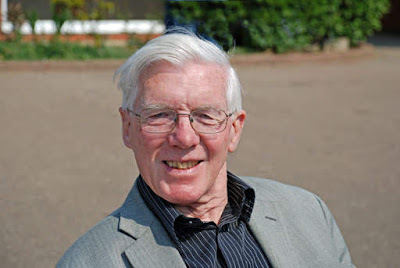 It is with great sadness that we announce the passing of Mike Clarke, one of the club’s early members and a highly competitive Merlin Rocket sailor back in the day. His funeral took place at North Herts Crematorium on Monday 14th May and was attended by many club members. He was 85 and had been suffering from dementia. 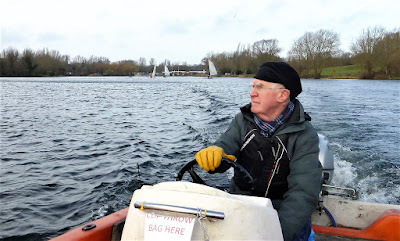 In his eulogy, Chris Clarke (Mike’s son) reminisced: “He introduced both Andrew and myself to sailing – with many a Saturday morning being spent at Stanborough lakes doing our best to race against others. 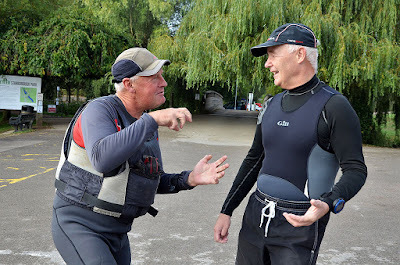 With Michael coaching us from the bank – telling us to ‘tack’, ‘gybe’ – or just not be so stupid! Typical Michael! He wanted to get the best from everyone. “Michael’s pride and joy was his Merlin Rocket – a beautiful wooden boat finished to the standard of a grand piano. 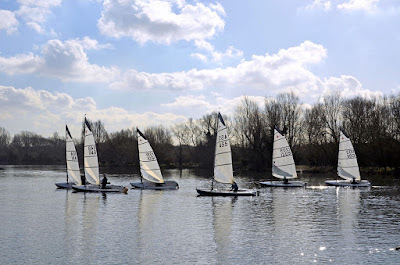 He loved sailing and racing it, but with ever-increasing problems with his knees, he became one of the founder members of ‘The Mouse Club’ – a branch of Welwyn Garden City Sailing Club who chickened-out from sailing when it was too windy, too cold, not enough wind, or if they were just too old! 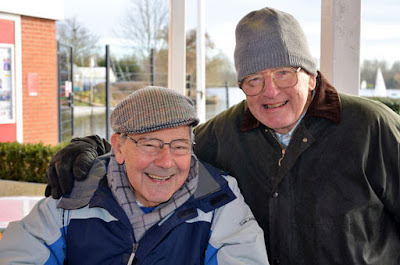 Even when Mike’s sailing days were over, he continued to be a strong supporter of the club, and was more than happy to help out with duties, or give a word of friendly advice. 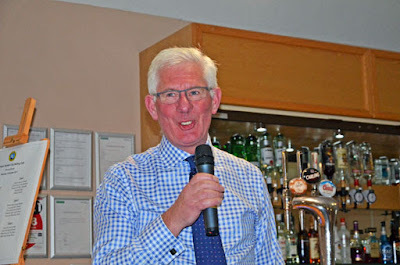 He will always be remembered as a great stalwart of the club. Please note this important event is on 30 June 2018. It was Commodore Nigel Davis’s day. Sailing his black-hulled Supernova, he beat everyone overall to win the coveted Easter Egg Regatta Trophy. 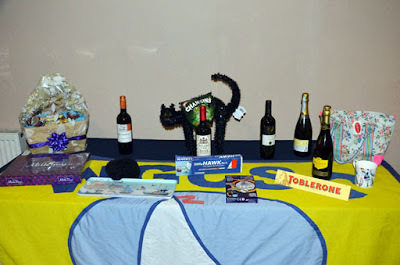 He also won a large luxury Lindt chocolate Easter egg for taking first place in the fast fleet. 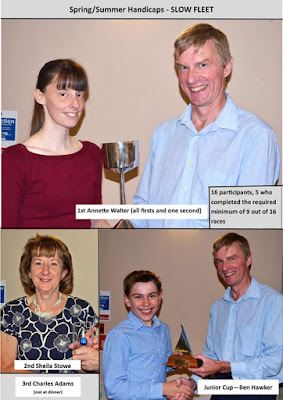 Annette Walter, who has won the race six times previously, had to be content with being Slow Fleet runner up to her father Phil, who came second overall and won the Easter Egg Cup donated by the Fishwick family, as well as a large Lindt egg for his first place in the slow fleet. At the presentations, Phil took great delight in accepting a Wispa chocolate egg on her behalf as she’d had to leave early. 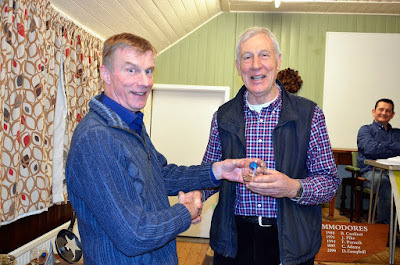 Roger Morse was the fast fleet runner up to Nigel, and was more than delighted to be photographed with his Wispa chocolate egg! 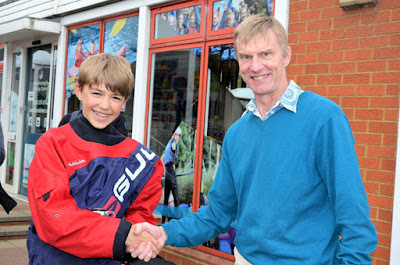 First Junior, was Tom Etherton, 14, who was presented with a large Lindt chocolate rabbit. He sailed extremely well in both races and ranked 7th overall. His best performance was in the second race when he was 4th overall just ahead of Peter Thornley and Charles Adams! He actually overtook Charles on the last lap and beat him on the water. He also beat his Dad, Will Etherton. 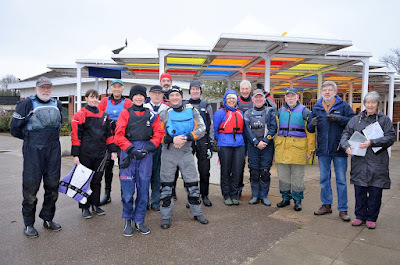 The Easter Egg Regatta was a very cold grey day with a light 0-1 wind, but it didn’t deter the 12 helms who took to the water to do battle which, as well as those already mentioned, included Dave Campbell, Patrick Rohart, Paul Lohr and Paul McAlister. 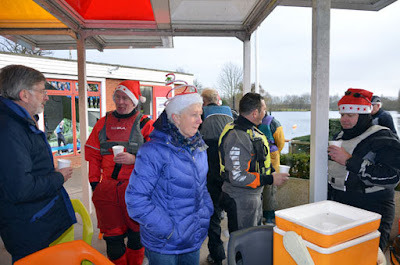 Two Welly ladies also played a prominent role in the event – Marjorie Adams was Assistant OOD working alongside Ian Stringer, and Louisa Hawker was the warmly wrapped-up RD Assistant, helping Shaun Smale in the safety boat. Charles Adams was the first helm across the line at the start of the first race and had a good lead on the rest of the fleet. 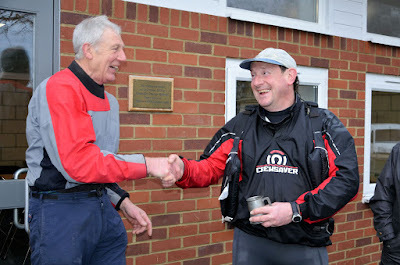 “best start for a long time but fat good it did me as I ended up all but last on the water at the end!” he joked afterwards. 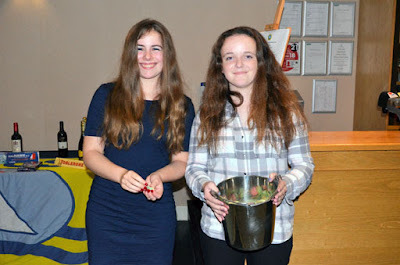 At the prize-giving presentation at the end of the morning, all onshore supporters were invited to dip into a bowl of mini chocolate eggs. 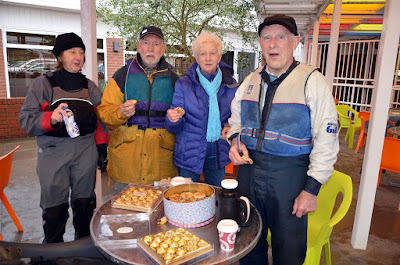 Not everyone found the racing fun - the wind was too little and too fickle, but the eggs were good! AOD Marjorie Adams (left) arrived back at her car after her duty to discover she'd been left a lot of luck by a passing swan! It was a first time on duty for Rescue Assistant Louisa Hawker (Centre). She came well prepared with her pink Marigolds. See the full set of photographs in a new window (full resolution) here or at a lower resolutions here. 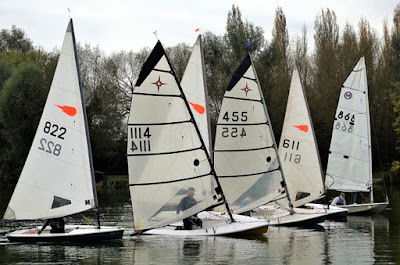 The 2018 sailing season kicked off on the 10th March with the first two Spring/Summer Handicap races. 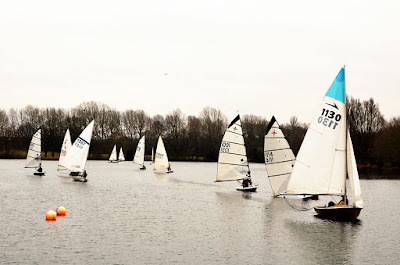 A total of 12 boats ventured onto the grey, lacklustre lake, some after a long winter layoff due to the “Beast from the East”. 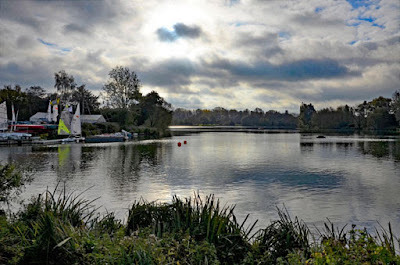 Conditions appeared to be very calm but this was deceptive as gusts suddenly punched through … as Patrick Rohart found out when he capsized on the start line. Patrick then had to catch the fleet, and he chased Shaun for the whole race, overtaking him in the very last minute. At coffee time Patrick was asked if Shaun had said anything to him, he joked: “Non, he iz round ze corner crying”. 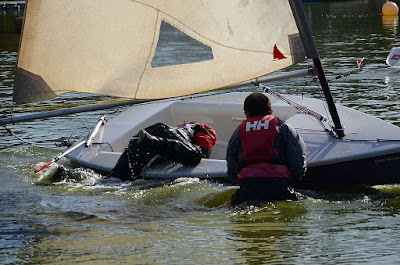 By some sort of Karma, Patrick’s boat capsized on top of him in the lagoon at the start of the second race! 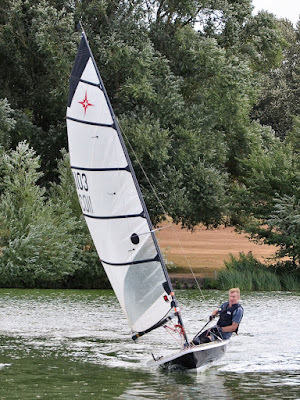 Alan Campbell has bought Pete Thornley’s Supernova and will be sailing it at Stanborough. 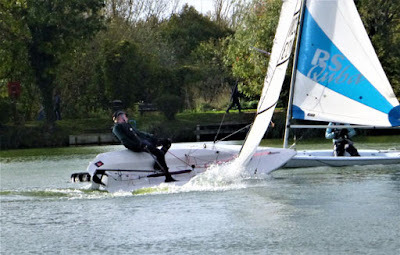 The Campbell Supernova has been taken to Grafham by Rob, and Dave is now back to his trusty Laser. Peter Thornley has gone back to his Streaker, which has now been promoted to the fast fleet courtesy of its new RYA PN (Portsmouth Number) of 1128. This should guarantee some lively competition in the future! 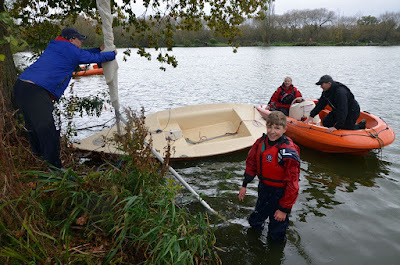 Will Etherton was fixing spreaders to the mast of his Miracle in the boat park, which he hopes to get on the water very soon. 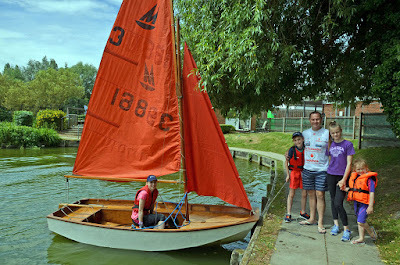 It was built by his Dad from a kit when Will was a youngster, but then his Dad discovered he didn’t actually like sailing! He also plans to get a stronger boom and sort out the sail. Watch out Charles! “Another really good year”, was how Nigel Davis summarised 2017 in his Commodore’s Report to the AGM . He said the average weekly number of boats on the water was 11 or 12, and the lowest was 6 to 9. 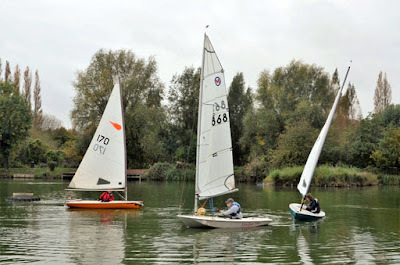 He wanted to encourage the club’s newer and younger members to sail more. He spoke of the sad loss of Piotr Caban and said a good number of WGCSC members had turned up to the funeral service. 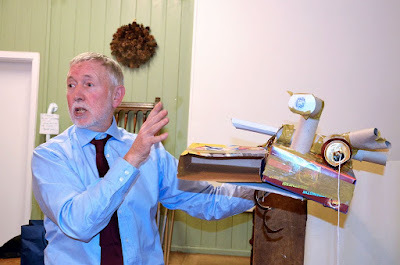 Mentioned “the biggest news of the year" - the shock damage to Peter Davis’s boat! 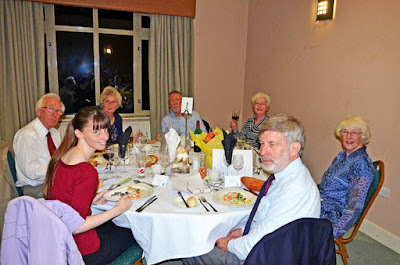 The Stewartby Interclub Competition had been a sad day for the club, but there’d been a great support team. “We’re going again this year. Let’s really make an effort and get that trophy back”, he urged. He was looking forward to another great year. 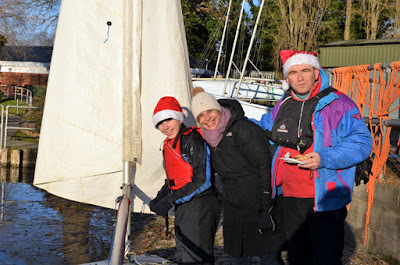 “We have a great relationship with Finesse and their support has worked well,” He thanked them for trusting us with their key, allowing us to sail on summer evenings, and use their rescue boat. 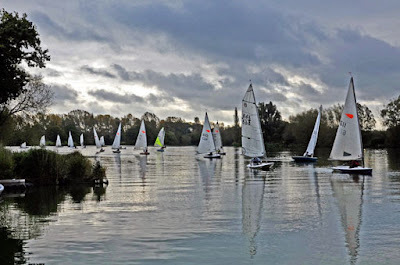 He also confirmed there would be summer evening sailing in 2018 on Thursday evenings, from Spring Bank Holiday (late May) through to the end of August. Treasurer Tony Hale said the accounts are in a healthy state and had been for a number of years, therefore the annual subscription would stay the same. 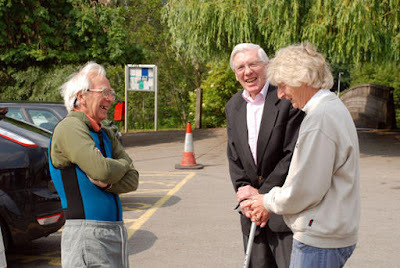 He thanked David Brown for taking on membership, and Charles for collecting money on Saturdays. Tony warned that membership was down. “Paid-up subscriptions are down to 56, of which 11 are new, but a number have just not renewed. The committee needs to take notice of that”, he said. Race Officer Charles Adams said racing was as keen as ever and attendance had been as described. He then went on to present the trophies. L-R, Peter Thornley, Roger Morse, Patrick Rohart, Annette Walter (Helm of the Year) and David Lambert. 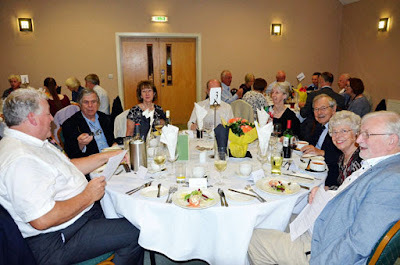 her reports and photographs of club activities which you see here on the website. a full list of the Awards (in a new window or tab). Ian Stringer was re-appointed as Honorary Auditor. 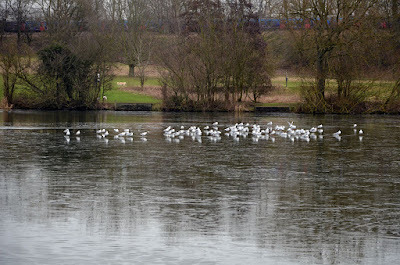 The top half of Stanborough lake was covered in ice. After some discussion, Race Officer Phil Walter and OOD Graham Hunt agreed to use just the bottom half for the first race, in the hope the situation might ease. 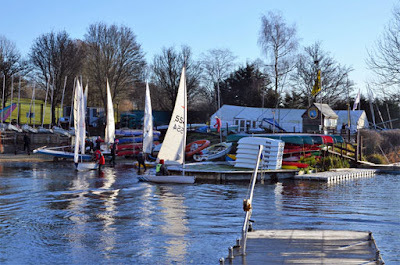 The sun was shining brightly and they knew the temperature was rising so hopes were high that much of the ice would have receded by the start of the second race. It was the first time anyone could ever remember this compromise decision being made in the club’s history. After the briefing, eight happy Wellys set out to do battle: Phil Walter (Comet), Roger Morse (Leader) and a six-strong fleet of Supernovas – Dave Lambert, Nigel Davis, Shaun Smale, Peter Thornley, Dave Campbell and Patrick Rohart. OOD Graham set a simple course, with the top mark as close as possible to the ice line. It worked, proving that half a lake is better than none! As predicted, more sailing space was available for the second race so everyone had a good morning on the water after all. 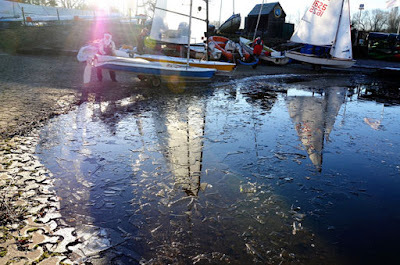 A thin layer of ice over the top half of Stanborough Lake meant OOD Nigel Davis had to cancel Burgee 11, and send all the Welly sailors home to watch the Winter Olympics (and later, the second round of the 2018 NatWest Six Nations Championship as England hosted Wales at Twickenham). Some times it's not possible to have it all. 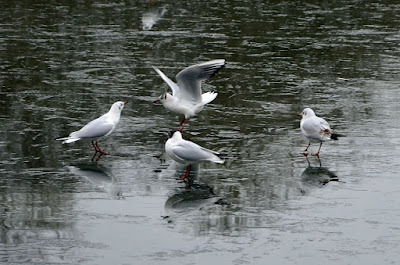 It was either that, or watch seagulls skating on ice. 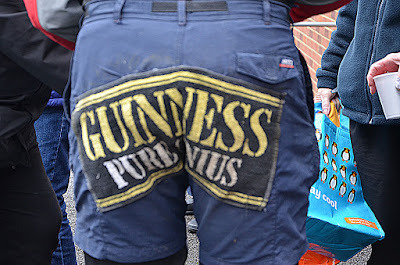 This year’s Welly Challenge was as chaotic and as much fun as ever. 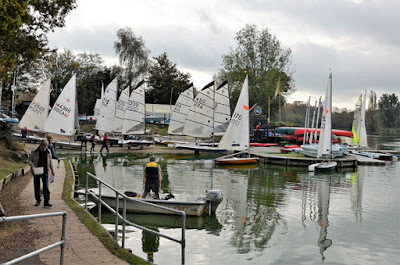 It raised the grand sum of £245, which is being donated to Grafham Sailability to help pay for new boats for disabled sailors. The theme was: “The Long Arm of the Law” and it was amazing how Wellys translated this into characters and fancy dress costumes. Master of Ceremonies, Roger Morse, walked around the room and invited everyone to introduce themselves and their outfits (he’d come as the Head of the FBI with the MEMO that Trump has just published). Shaun Smale’s take on things was extremely literal. He had a long pole with a leather glove on the end with pointing finger, which he said was “The Long Arm of the Law”! On the side of the Law, there was: the Statue of Justice (complete with golden sword and balancing scales), a lady barrister (with wig and black gown), policemen and policewomen, a police inspector, a member of Neighbourhood Watch with binoculars, the tea lady from the police station and her husband, as well as Secret/Special and Undercover agents, a SWAT team member, a helpless hostage, and a wife with a ball and chain round her neck. 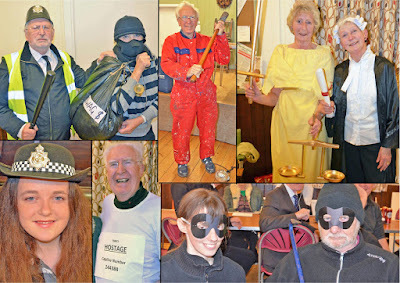 The villains and illegals included, a convict serving hard labour with a ball and chain round his ankle, several masked burglars, a large criminal gang (looking suspiciously like Graham Hunt’s family), and an illegal immigrant hiding under a coat (discovered by Roger to be Patrick Rohart). The evening’s challenges were as eclectic as ever. There was a quiz on World Leaders - inspired by the Leader dinghy apparently! (Who can honestly remember these - (China) Xi Jinping , (Zimbabwe) Emmerson Mnangagwa, and (New Zealand) Jacinda Ardern ?). This was followed by a hard-to-crack cryptic quiz on UK place names. 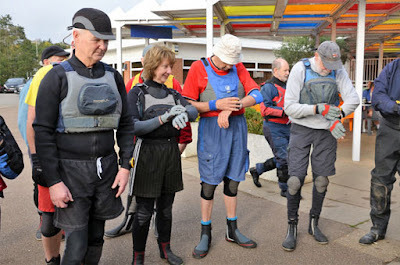 Light relief came when Carol Brown introduced the ever-popular practical Welly Challenge. 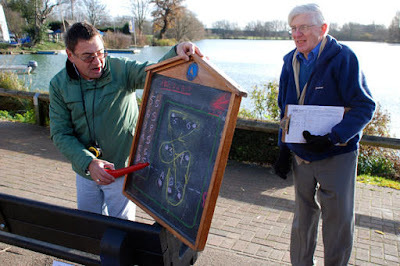 She read out a scenario which was about Welly sailors being kidnapped by Finesse, and set the Fast and Slow teams the task of making a gadget to help track them down. Old newspapers were also handed to each team so print could be cut out and stuck on a message board for police. 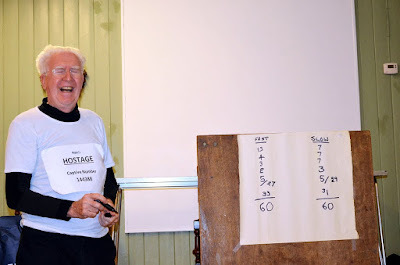 At the word “Go”, there was much ripping of cardboard and sticking by the two eager teams, and the ingenious results were eventually judged by Roger. When David Brown, came to tot up the figures on the Score Board, it was a 60-60 Draw. For the first time, the winners were not the Fast Fleet or the Slow Fleet. Honours were Even! 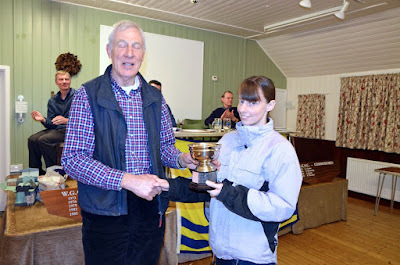 The "Last Blast of the Year" was specially arranged and organised by our Race Officer, Charles Adams - a special Personal Handicap Pursuit for the "End of Year Tankard". It took the form of two pursuit races with everyone starting at the same time but covering different distances according to their boat and current personal handicap - a special handicap calculated scientifically by our Race Officer. 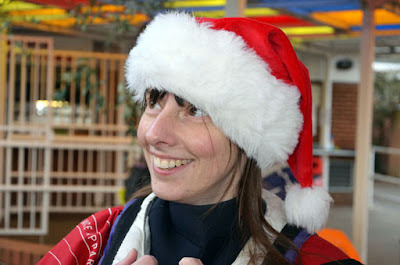 It was also advertised as an opportunity to display those new pullovers, gloves and scarves as delivered by Santa(!) and sample the leftovers from Christmas plus the special recipe club Punch supplied by Marjorie, fortified to taste with a drop of Rum, courtesy of Anthony Willis. Thereafter, the "Last Blast" got accorded the title of The Rum Pursuit. 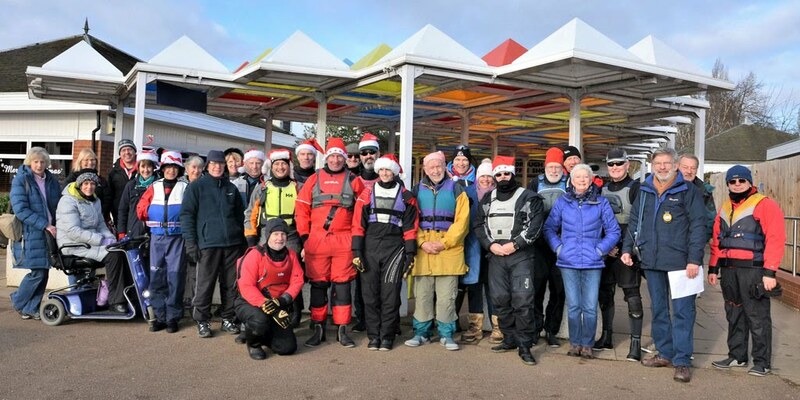 Strong winds were not going to stop Welwyn Garden City Sailing Club running their resurrected End-of-Year Pursuit races on Saturday, 30th December. (See Historical Note below). 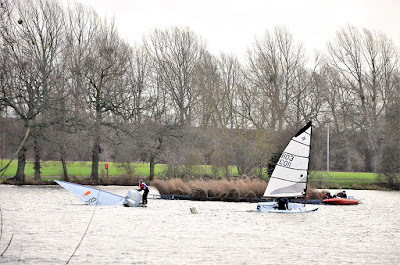 Sudden 30-40 mph gusts hit the competitors at regular intervals as they battled round the course. 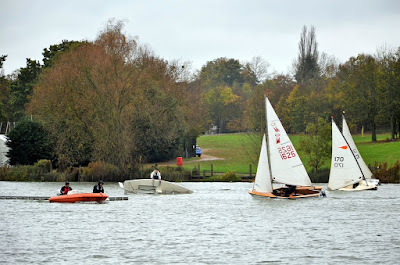 There were spectacular sights of speeding boats lost to view in spray and inevitable capsizes. 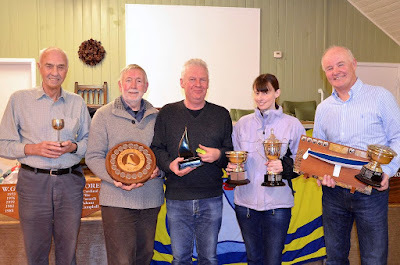 After two exhausting 3/4 hour races Alan Campbell emerged as the clear winner with Commodore Nigel Davis second, Annette Walter third and Mike Caddy fourth. Although Annette didn’t win, she never stopped smiling as she powered along on the plane! The Rescue Driver had to concentrate so hard...................that his skylight popped open to keep him cool! 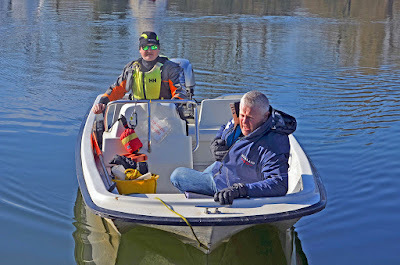 Thanks go to Rescue Driver David Brown, and his assistant, Race Officer Charles Adams, who ran the two pursuit races from the safety boat. Charles also managed to take some fantastic action photos while stationed at the top end of the lake supplemented by some from Val. 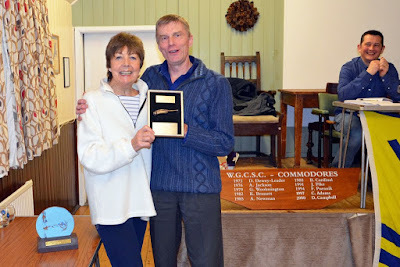 Appreciation also goes to Sheila Stowe and Dave Campbell who did duties in the race hut, counting laps and making sure everything ran smoothly. This is how your watch works..... But I'd rather try to open this rum. Members of the Mouse Club (below) turned out in force to cheer everyone on and were rewarded with reviving glasses of Marjorie's hot punch with rum added to taste from Antthony's bottle of Lambs Navy Rum. There was also a spread of hot mince pies, chocolate biscuits and more, courtesy of Thelma Cardinal. ...to end the "Rear of the Year 2017!!!!" 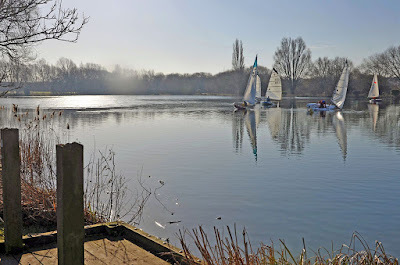 It was a perishing-cold morning, with shards of ice in the lagoon, and frost on the boat-covers in the dinghy park, but the winter sun shone brightly in a clear blue sky. Fourteen eager Wellys signed on for the first Christmas Pud race, included four Supernovas and six Comets. A light layer of broken ice on the Lagoon area. 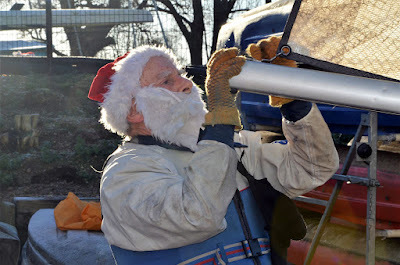 Santa (alias Dave Campbell) rigs his dinghy. OOD Ian Stringer and AOD David Brown set a simple triangular course of 5-6-1, taking all to starboard. At the hooter, Nigel Davis was first across the line, closely followed by Dave Lambert and both held these positions in the Fast Fleet for the whole race, and repeated this in the second race. 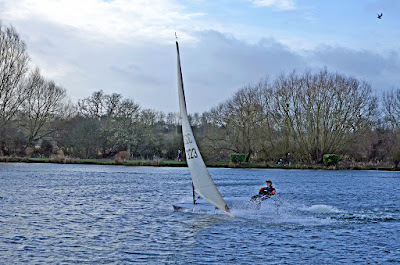 There was a light breeze which made it essential to pick exactly the right moment to tack, on the beat back up to Mark 1, to gain any advantage. In the Slow Fleet, Annette Walter and Charles Adams quickly settled in to first and second places in the first race. In the second Annette sailed off into the distance to compete with the Supernovas. Charles was left adrift behind everyone after a good start and only recovered second position from Phil Walter at the last mark. 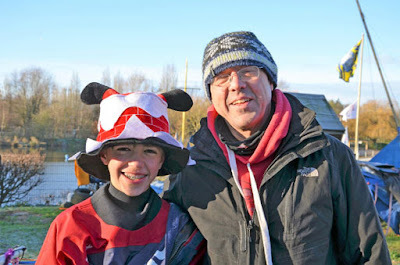 It was good to see rising juniors Tom Etherton and Ben Hawker in the first race, but Ben disappeared before the second race … the rumour was he went off to see “Star Wars”! 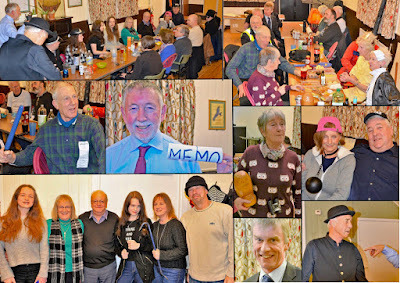 While the sailors were hard at it on the water, members of the Mouse Club were enjoying festivities onshore including Mike & Sylvia Smith, Mike Fairman, David Boyce, Brian & Thelma Cardinal, Marjorie Adams, Sybil Morse, Pauline Shaw, David Newton, Maureen Blunt and honorary MC members Sheila and Val ‘on sick leave’ from sailing. 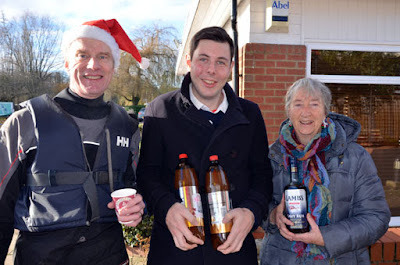 To everyone’s surprise, Anthony Willis arrived with the very generous gift of a bottle of Navy Rum and two large bottles of ginger beer. Mouse clubbers decided these should be used in a punch to welcome in the New Year. At the end of the morning, Marjorie produced several flasks of steaming hot punch and a big insulated box full of hot mince pies, which were very welcome on such a bitter day. 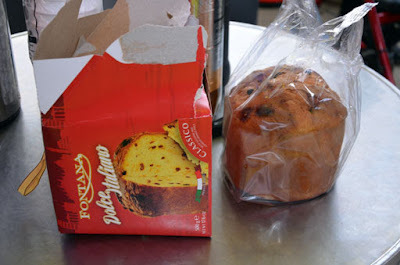 Café owner, Vince, donated a Panettone cake to the gathering, which was also much appreciated. Finally, thanks must go to Rescue Driver Alan Pearce and his Assistant, Simon Hawker, who were nearly frozen solid by the end of the morning. The forecast for Winter Handicap races 9 and 10 on Saturday 4th November was for heavy rain and high winds. 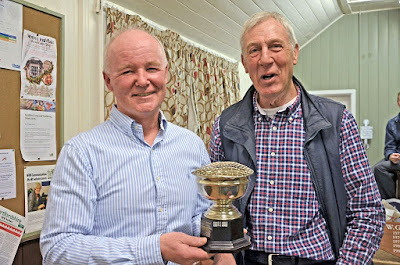 Amazingly this didn’t put anyone off, including the two Welly “Birthday Boys” – Dave Campbell and Roger Morse – who’d been celebrating their 80th and 70th birthdays the night before. 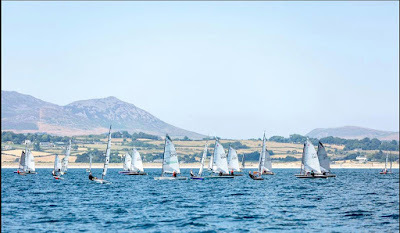 After the briefing by OOD, Graham Hunt, 12 boats took to the water and everyone had a great sail in breezy (and, by that time) dry conditions. At coffee, a birthday celebration feast appeared. Dave brought out two large boxes of Ferrero Rocher chocolates, and Roger’s wife Sybil, produced a big box of homemade Welsh cakes, and everyone was invited to “tuck in”. 12 Helms enjoying a breezy first race. A birthday feast appeared at coffee time. These three made sure of their share. Eventually, Dave decided to “abandon ship” and climb aboard the safety boat. However, our Birthday Hero didn’t stop there - he then went on to assist rescue at the top of the lake where young Tom Etherton and Ben Hawker, had also capsized and become trapped on the bank by overhanging trees. Second race was much livelier Oops! Dave is over but son Alan sails by without a glance! Birthday Boy Roger sails past too! 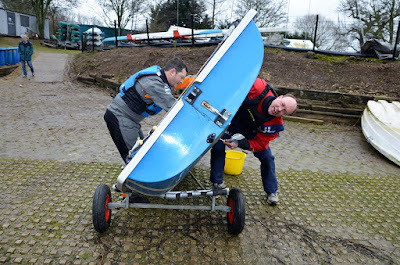 Dave continues to struggle .... abandons ship .....and joins the rescue effort at the top of the lake! It turned out to be an eventful morning-after-the-night-before for Dave Campbell, but his fellow “Birthday Boy”, Roger Morse, managed to keep his feet dry. 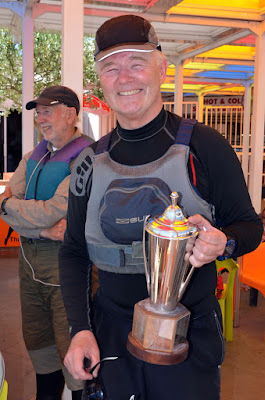 * Fast Fleet: Patrick Rohart came 1st in the first race and Alan Campbell 1st in the second race. 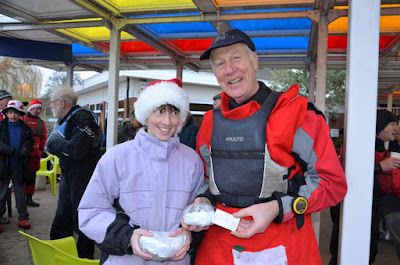 * Slow Fleet: Annette Walter came 1st in both races. The full photo album can be viewed here. Half way up the first leg I spotted a tree that needed pruning and spent a while relaxing in the shelter until a favourable wind shift allowed me to shoot back into the race. I spent the rest of the race lurching along mainly in the shelter of the trees on the western bank whilst unsuccessfully removing water and willow. Meanwhile in the proper race, it was mainly the women that were showing the way. Annette (Comet) skipped along ‘nay bother’ to win both the slow and combined fleet races; easily. Newcomer Katharine Woods (RS Q’ba) also showed us the way to handle the alternating light wind and severe gusts with a 3rd in the first race and third overall. In the second, she was denied another ‘podium’ because her boat’s mast was ripped out. Sheila Stowe opted to help Roger Morse in the Leader. With wise heads in the boat they picked their way round the course with less drama than most, rarely coming out into the full force of the wind, to secure an overall third and second. and the whole Google Photo Album here. (New window). All sorts of other good things went on too … competition remained fierce amongst the Supernovas trapped all morning wherever there was no wind with only Nigel escaping. 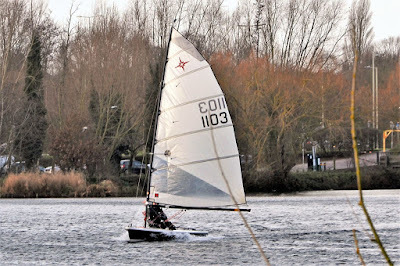 It was pleasing to see the juniors growing in confidence with Tom Etherton sailing his Comet 170 into 10th place in both races. 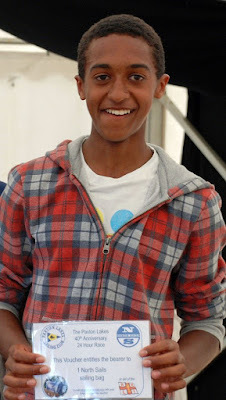 His fellow junior, Ben Hawker, had a 12th and 11th but, more importantly, he too was competing well against all the more experienced sailors. Both have lots of exciting potential. 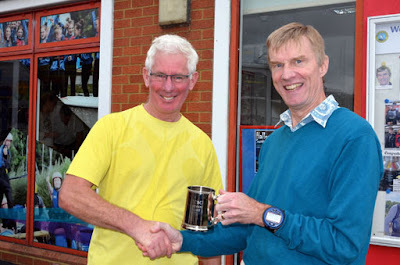 Dave Lambert & Patrick Rohart are presented with their trophy by OOD Ian Stringer. In the end it was a miracle we had any racing at all…. We had eventually found a date suitable for both clubs only to find in the last week that there could be no sailing on the lake until 1.00pm, there was an accident on the A1(M) making it difficult to get to Stewartby and hanging over the whole event was a weather forecast indicating 2 mph wind at the beginning of the afternoon. Not surprisingly most opted to use the club boats on offer. 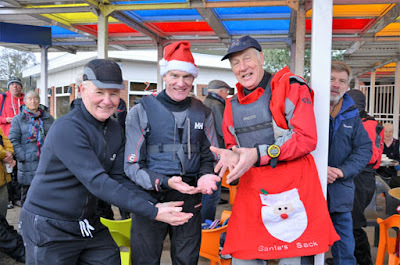 The fishing competition concluded and we were free to race (12 anglers on an enormous lake – don’t ask!!). However, the first race was delayed until there was enough wind to move the sails (the turbine looming over the venue was still not moving). 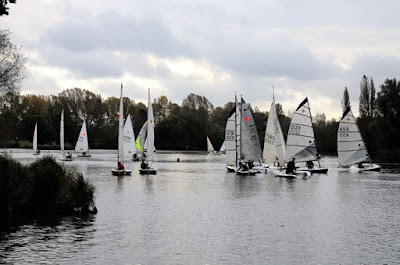 The course is usually carefully set at Stewartby and there is never anything other than a beat to the first mark. 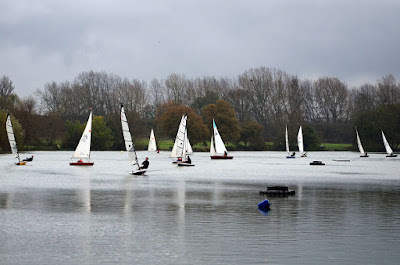 A short course, compared with normal, was in place and boats were actually moving at the start reaching or running. The first race starts and they’re off! Peter Davis led off the line closely followed by Charles Adams emerging from behind the committee boat. 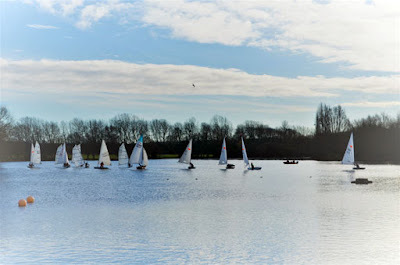 They pulled away on the right hand side of the course until the wind dropped and headed them. 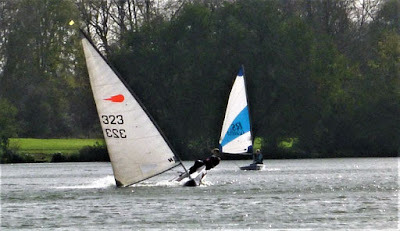 The Stewartby SC pair of Bill Strange (Streaker) and Terry van Rijn (Laser 8.1) crept up and eventually went ahead on the ‘reach’. Richard Hargreaves (RS 300) worked through the fleet after a slow start and eventually followed Terry over the line 3 sec down. Michelle had her best race ever and was near the front for a long time but even after falling back ended up fourth on handicap. Bill was first on handicap followed by Terry. Peter Davis and Charles sailed close behind the Streaker but on handicap were 9th and 3rd. Back in the pack Peter Thornley drifted in to 7th and resolved to find something better to do for the rest of the day. Mike Caddy had the same thoughts on finishing 11th. 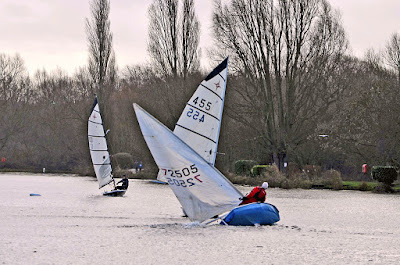 Nigel and Paul had a good race with the two Stewartby Albacores until entering a third lap (two would have been more than enough) they fell further and further behind in the dying wind. Suffering similarly were Stanley and Paul who struggled in ‘no wind’ with fully battened sails. 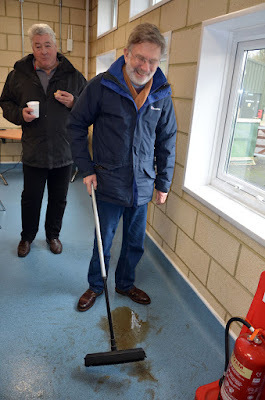 Charles had gone for some food when the second race was called so arrived rather late at the start along with Paul McAlister who had opted to take over Peter’s abandoned Laser. Finding more wind on the right of the course Peter Davis and Terry van Rijn fetched the first mark and were never seen again. The day was awful for sailing and made worse as the afternoon went on by the waves created by water skiers and body boarders coming out to play. 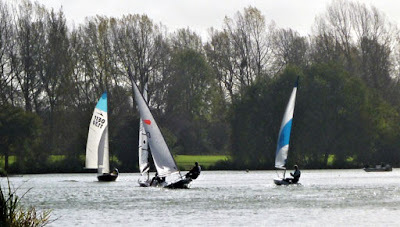 Charles made his way through most of the fleet to race alongside Stewartby Firefly and Streaker ending 5th on the water but only a 7th on handicap. 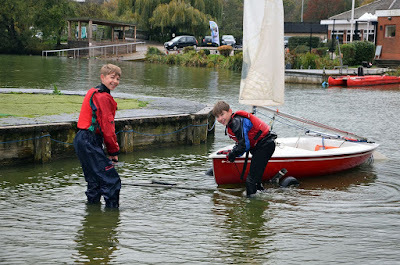 The only other Wellies to finish the second race were Paul and Stanley. 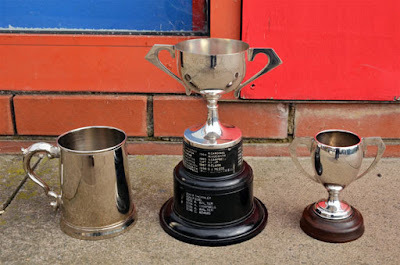 Congratulations to Stewartby SC who took the club honours once again … (but WGCSC willl be back!) With the best three individual results from the combined race scores to count, Stewartby won the team result easily (25 to 48 points). Terry van Rijn won the individual competition with Charles second. 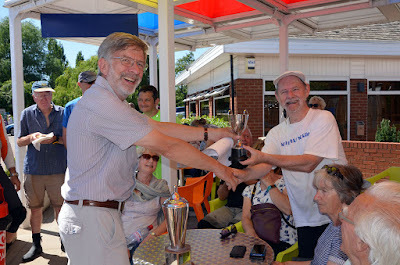 He picked up a second bottle of wine for being first visitor with Peter Davis collecting a bottle for second place. 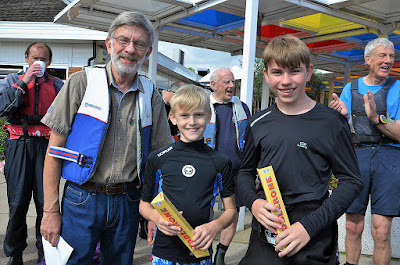 So Charles and Peter contributed to the team score along with Stanley Turner, our only junior sailor at Stewartby completing the top Trio. Well done Stanley. Many thanks to Stewartby SC for their great hospitality. 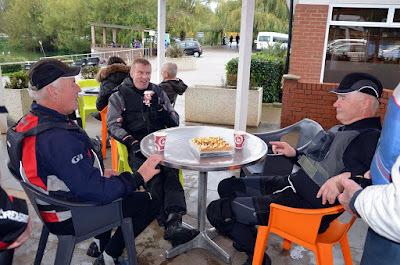 In spite of the lack of wind we all had a great time. It was good to see the Welly support with partners and parents of the sailors but also Pauline Shaw, Val Newton, Dave Campbell (after abandoning his attempt to get through the traffic on the A1(M) with his boat), the Cardinals, the Browns, Tom and Will Etherton, and many of the Forsdike family including Janet and John, Ian and (4 yr old) Owen. And up to Stewartby to re-acquaint himself with his original Supernova was Frank Puranik. He opted out of trying to race for the first time for ….ages…. and in no wind. 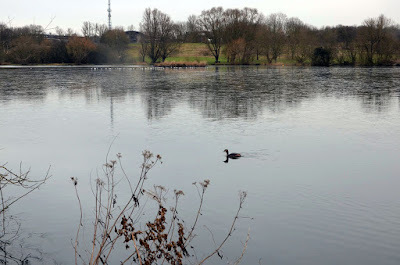 He returned the next day in very different conditions; with Tim Browning as Race Officer and Charles Adams on rescue duty he was seen flying across the lake. He’s back – hopefully to be seen in his newer Supernova at Stanborough. Charles Adams (Aero) leading the fleet into the second lap of the first race, with Peter Davis (Phantom) close behind. Charles and Peter with their bottles of wine. 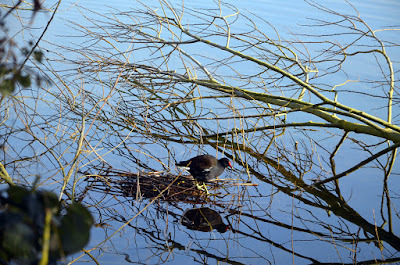 Webmaster's Comments: See some of Val's photographs which deserve being shown to greater advantage below. See the full set of Val's photographs here. And a "Morning After" photo from Charles!